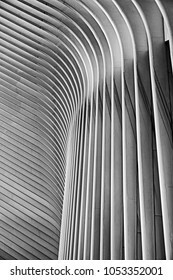 I restarted creative photography in 2002 after a detour to build a business career. 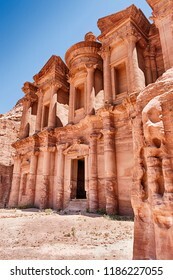 I enjoy all subjects; recently have rediscovered the joy of film. 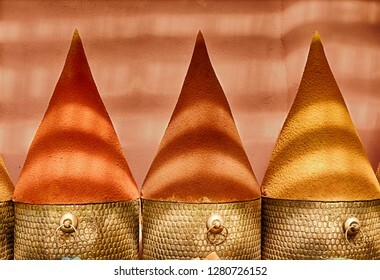 Spices are built into large cones for display in the spice markets in the Marrakesh souk in Morocco. Bands of light come from the ceiling covering. 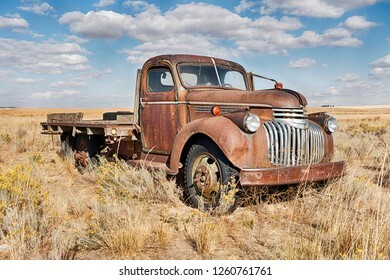 HARTLINE, WASHINGTON - OCTOBER 7, 2018: An old farm truck is slowly rusting amid the sage brush of an empty field in Eastern Washington. 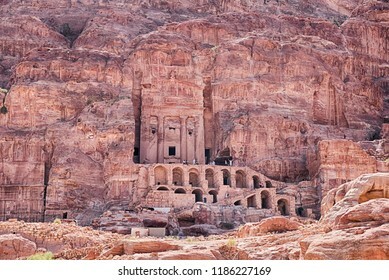 The Triclinium is built in front of the Obelisk Tomb near the entrance to the necropolis of Petra in Jordan. 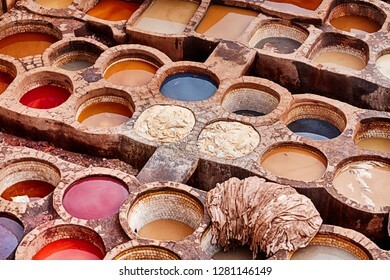 Pits of various colored dyes are used in the Chouara leather tannery in Fes, Morocco, to add color to the leather skins after they have been tanned. 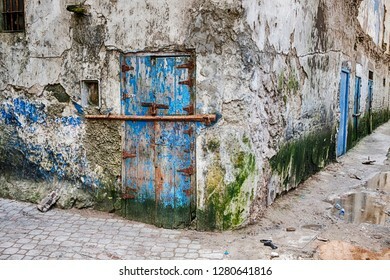 A battered old blue door with a bar for security in a run-down neighborhood is located at a street corner in the Mellah portion of Essaouira in Morocco. 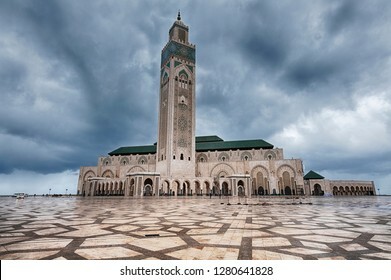 Viewed over a huge plaza made of granite stone on a dark and cloudy day, the Hassan II Mosque in Casablanca, Morocco is one of the largest mosques in the world. 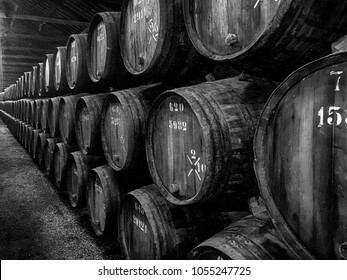 Hundreds of barrels, or pipes, of vintage port are stacked up in a long row to age in a winery in Portugal. 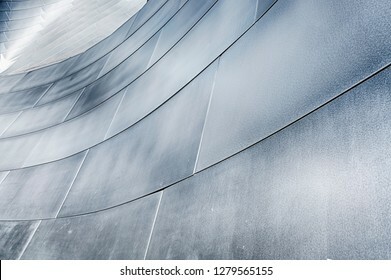 LOS ANGELES, USA - SEPTEBMER 25, 2017: An architectural detail of the Walt Disney Philharmonic Hall in Los Angeles showcases the curved design elements of the architectural design of Frank Gehry. 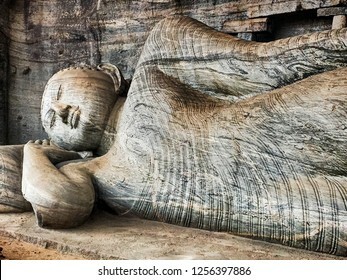 A reclining figure of Buddha is carved into the stone cliffs at the historic landmark of Gal Vihare in the ancient city of Polonnaruwa in Sri Lanka. 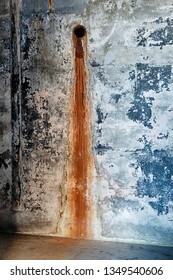 On old pipe has created a rusty water stain on a concrete wall inside Fort Casey on Whidbey Island in Washington State. 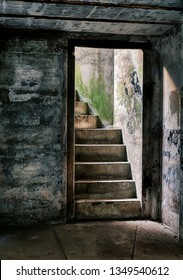 A stairway leads upwards towards the light from one of the underground supply rooms at Fort Casey on Whidbey Island in Washington State. 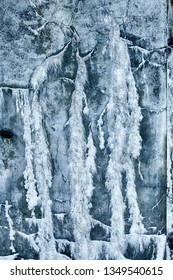 An abstract pattern formed from water seeping through a concrete wall at Fort Casey on Whidbey Island in Washington State. 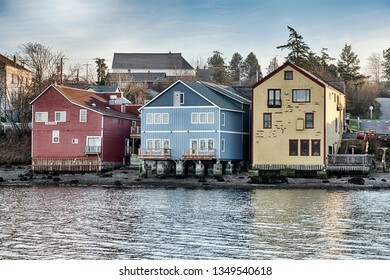 Three old buildings anchor the waterfront strip of downtown Coupeville on Whidbey Island in Washington State. 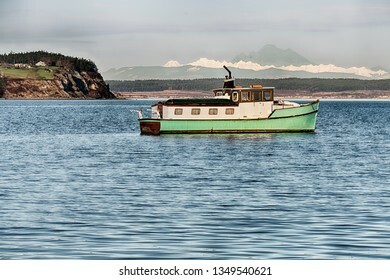 A wooden cabin cruiser at anchor in Puget Sound with the Cascade Mountains in the background. 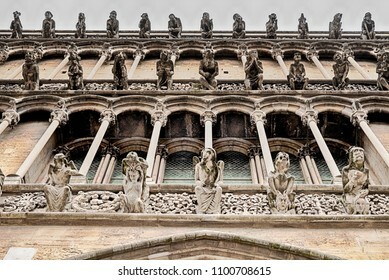 The front facade of the Notre Dame cathedral in Dijon, France, is lined with different gargoyles looking out over the city. 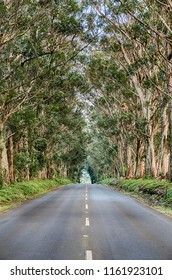 The Tree Tunnel is a long row of Eucalyptus trees that line the first mile of Maliuhi Road and that create a natural gateway to the South Shore of Kauai. 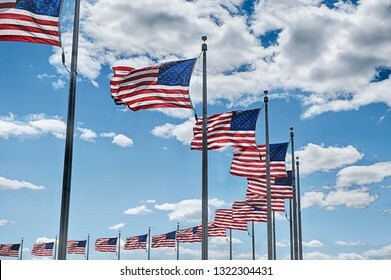 A circle of American flags circle the Washington Monumument on the National Mall in Washington DC. 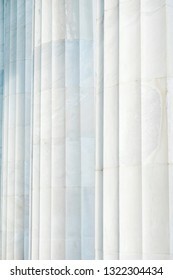 A background that shows the subtle coloring and the fluting on three white marble columns at the Lincoln Memorial in Washington DC. 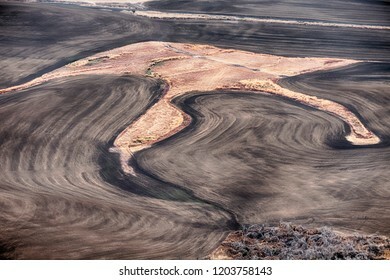 A small section of natural prairie is surrounded by plowed fields that are waiting to be planted in the Palouse area of Eastern Washington. 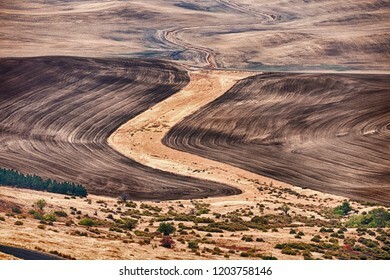 A view of the wheat fields below Steptoe Butte in the Palouse area of Eastern Washington highlights the autumn colors. 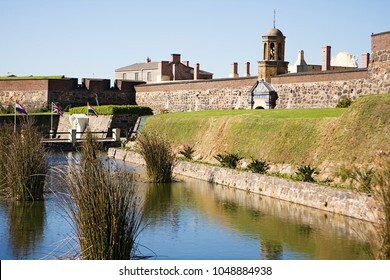 The Castle of Good Hope is the oldest building in Cape Town, South Africa. The old fortress is surrounded by a moat with the original entrance to the right. 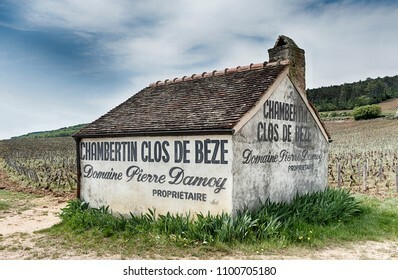 GEVREY-CHAMBERTIN, FRANCE - APRIL 22, 2018: A small farm building sits in the middle of the Burgundy grand cru vineyard of Clos de Beze near the town of Gevrey-Chambertin in the Cote de Nuits region. 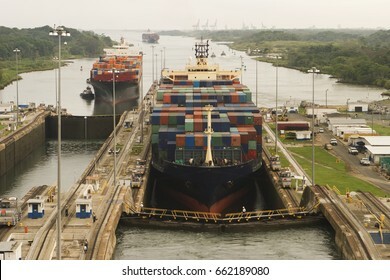 Two freighters, led by tugboats, are starting to transit the Panama Canal at the Gatun Locks on the Atlantic side. These container ships are fully loaded with cargo heading west towards the Pacific. 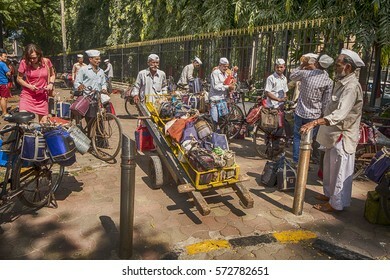 MUMBAI, INDIA - NOVEMBER 10, 2016: In Mumbai, a dabawalah with a fully loaded hand cart sets off to deliver lunches from the train station to people in offices and shops throughout the city. 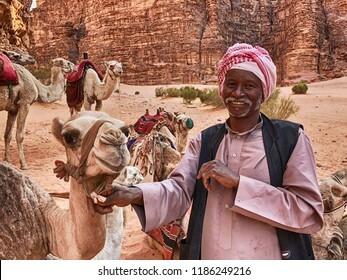 WADI RUM, JORDAN - JUNE 14, 2016: A smiling Bedouin camel herder holds one of his camels in the canyons of the Wadi Rum desert in Jordan. 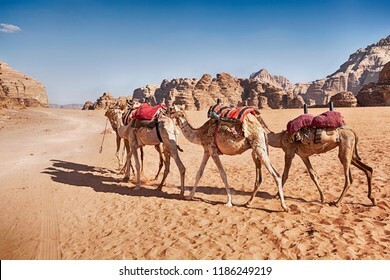 Three camels with saddle blankets walk through the sandy desert of the Wadi Rum valley in Jordan. 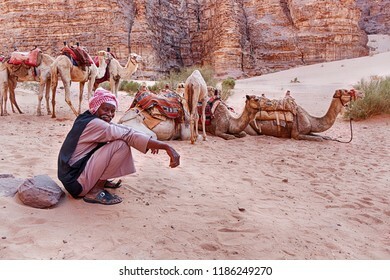 WADI RUM, JORDAN - JUNE 14, 2016: A Bedouin camel herder rests near his herd of camels in one of the siqs of the Wadi Rum desert in Jordan. 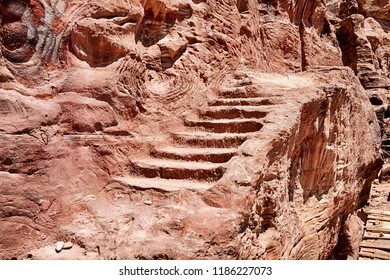 A small series of stone steps, as an old stairway, leads up the side of a cliff to the Urn Tomb on the edige of the ancient city of Petra in Southern Jordan. 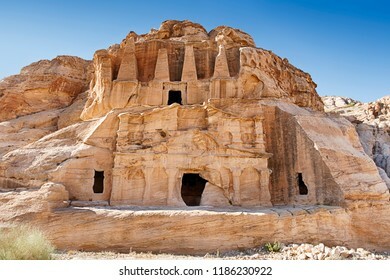 The Urn Tomb, a part of the Royal Tombs of Petra, is carved into the sandstone cliffs with a grand staircase to climb. 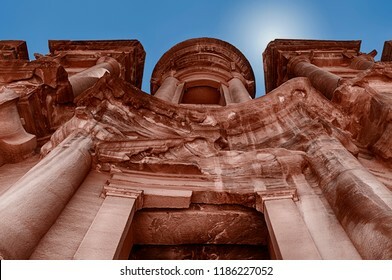 Standing beneath the Monastery in Petra and looking up to the sky, one can see the incredible detail of this edifice carved into the sandstone cliffs. 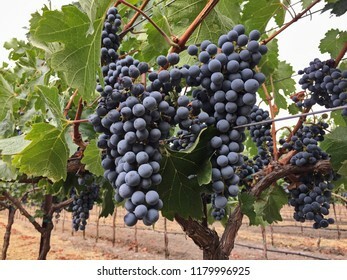 A cluster of almost ripe cabernet sauvignon grapes in a Napa Valley vineyard are a bluish-purple color. 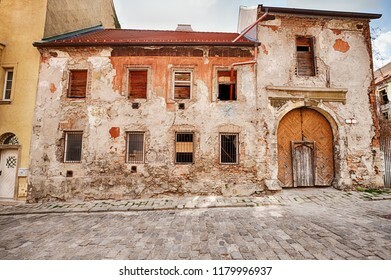 An old building with a large wooden door entrance that is in need of repairs stands next to a street of cobblestones in the Old Town (Stare Mesto) of Bratislava in Slovakia. 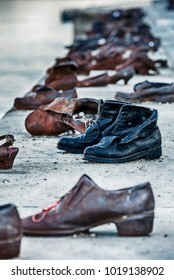 BUDAPEST, HUNGARY - MARCH 31, 2017: A pair of black shoes stands amidst the Shoes On The Danube Memorial in Budapest which was created by Can Togay and Gula Pauer. BARCELONA, SPAIN - APRIL 18, 2015: A scene on the Passion Facade of the Sagrada Familia portrays Judas kissing Jesus. 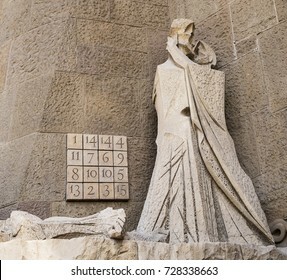 The numbers in the Subirachs Magic Square allude to the age of Jesus (33) then. 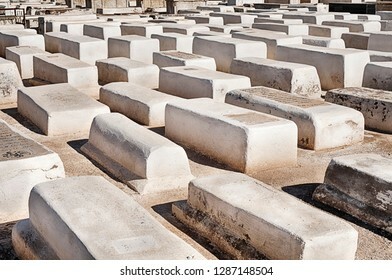 MARRAKESH, MOROCCO - OCTOBER 24, 2018: Anonymous white tombs mark the graves in the ancient Jewish cemetery and historic landmark in Marrakesh, Morocco. 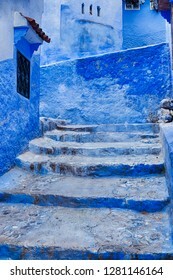 In the Blue City of Chefchaouen in Morocco, large parts of the old city medina is painted with a bright blue paint. 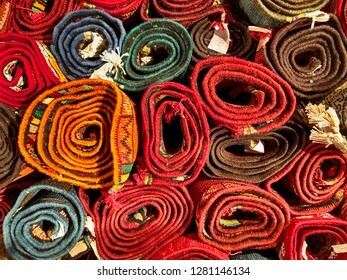 Many wool carpets are rolled up and waiting to be sold in a rug store in Fes, Morocco. 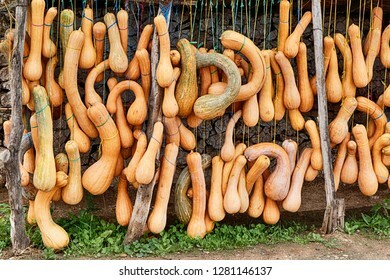 A roadside market near Fes in Morocco displays a variety of yellow; squash for sale that are hanging by strings for visibility from the highway. 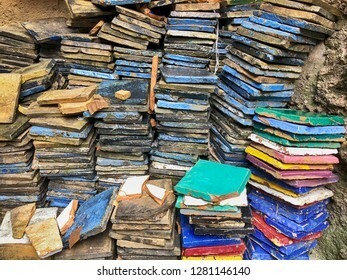 Stacks of brightly colored tiles are piled up outside a kiln in a ceramics factory after being fired to bake in the colors. 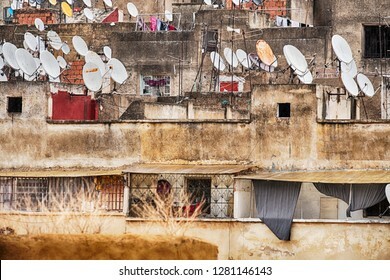 Satellite dishes cluster on the rooftops of the houses in the old city, or medina, of Fes in Morocco. 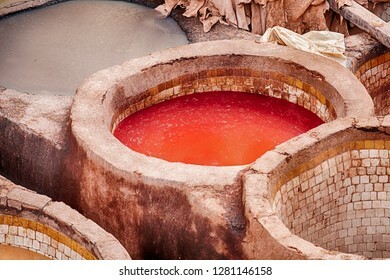 The open air historic Chouara leather tannery in Fes, Morocco is filled with stone vats containing dyes and animal hides that are being colored. 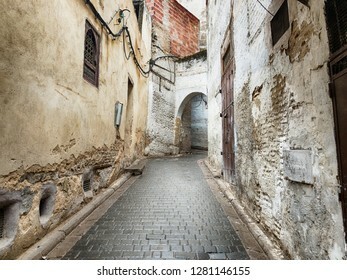 A narrow street in the old city of the Fez medina in Morocco leads up the hillside through an arch. 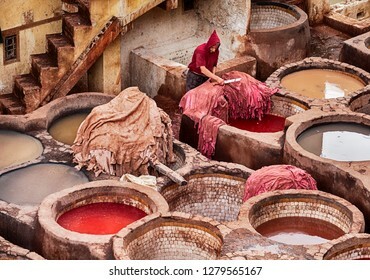 The outdoor leather tannery of Fes in Moroco contains hundreds of dye pits including some with bright red dyes. 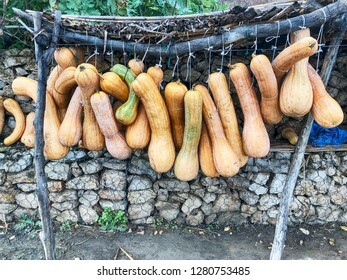 Ripe yellow squash hang at a roadside market stall on the road between Fes and Chefchaouen in Morocco. 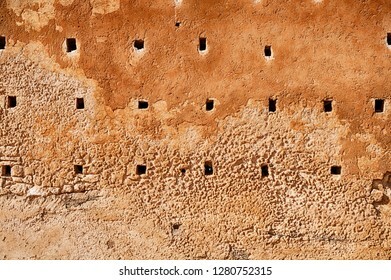 The exterior surrounding wall of the unfinished mosque known as the Tower of Hassan in Rabat, Morocco is pockmarked with square holes that were intended to hold beams of woods for floors. 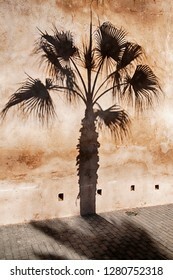 A palm tree casts a dark shadow on the exterior fortress wall of the Kasbah of the Udayas in Rabat, Morocco. 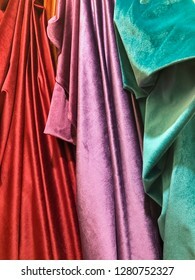 Rich red, purple and green bolts of fabric are draped from a rack in a cloth store in the souk of Marrakesh in Morocco. 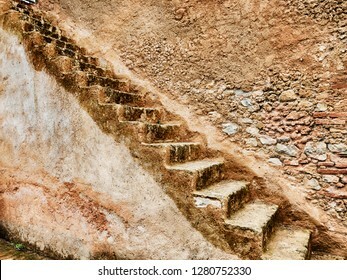 A series of stone steps runs up outside a tower in the casbah of Chefchaouen in Morocco. 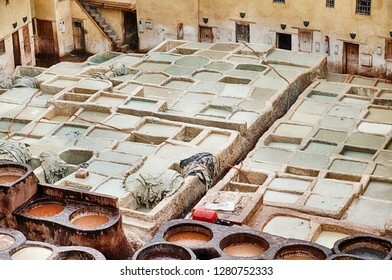 The outdoor leather tannery in Fes in Morocco consists of a number of different pits that are filled with different chemicals to tan and dye leather. 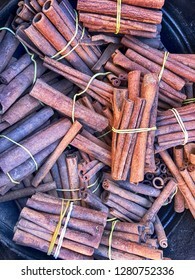 Bundles of cinnamon bark are on display at a spice market in the Marrakesh souq in Morocco. 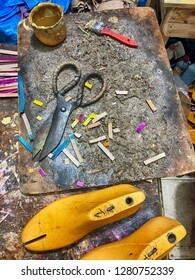 The workbench of a cobbler, or shoemaker, in the main souk market of Marrakech in Morocco includes shears, wooden forms, scraps of leather and a glue pot. 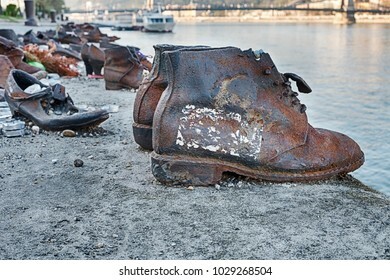 BUDAPEST, HUNGARY - MARCH 31, 2017: Two rusty boots in the memorial for the Shoes On The Danube, created by Can Togay and Gyula Pauer to commemorate Hungarian Jews who were victims of the Holocaust. 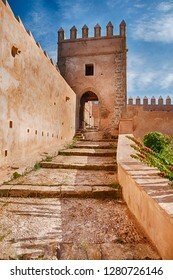 A ramp with steps leads upwards towards one of the guard towers that are located on the outside walls of the Kasbah in Rabat, Morocco. 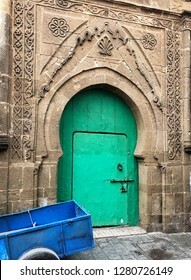 A bright green door contrasts with the blue hand cart and the ancient stone walls of the buildings in the souk of Essaouira, Morocco. 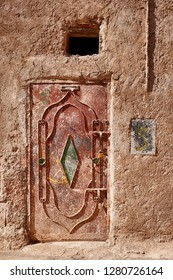 A metal door offers security to a house in the old Mellah district of Marrakesh in Morocco. 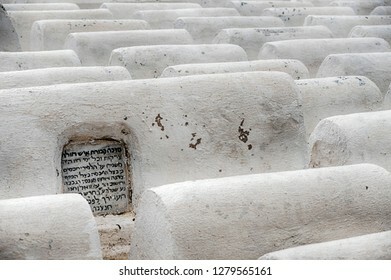 Acres of similar white tombs fill the old Jewish cemetery in the Mellah neighborhood of Marrakech, Morocco. 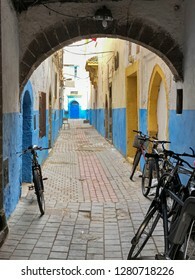 A narrow street, or alley, just off the main street is empty except for some bikes. 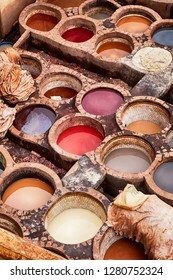 This is in the souk of center of the old city of Essaouira, Morocco. 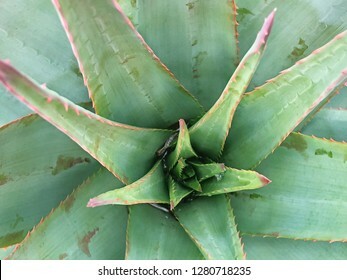 The spiky leaves of an aloe plant radiate from the center as seen from above. 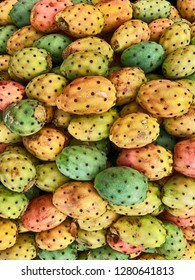 The fruit of the prickly pear cactus, as seen in a market stall in Casablanca, is considered a delicacy in Morocco. 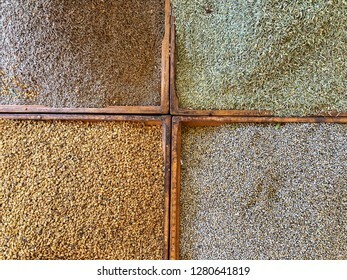 Four bins in a market stall are filled with different colored seeds or spices that make a nice background. 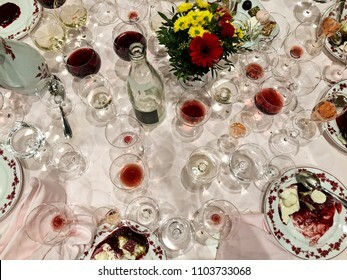 After a long and elegant dinner, a table with white tablecloth is full of empty and half-empty wine glasses and half-eaten desserts. 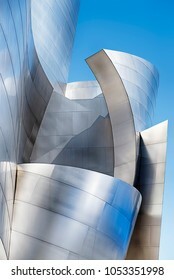 LOS ANGELES, USA - MARCH 5, 2018: A wall of metal panels on the exterior of the Walt Disney Philharmonic Hall designed by Frank Gehry reflects light in a shimmering pattern for an abstract background. 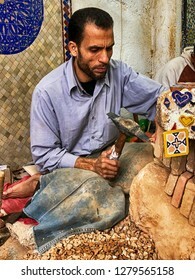 FES, MOROCCO - OCTOBER 19, 2018: A worker in a ceramic factory in Fes, Morocco uses a hammer to chisel in small details for decorations. 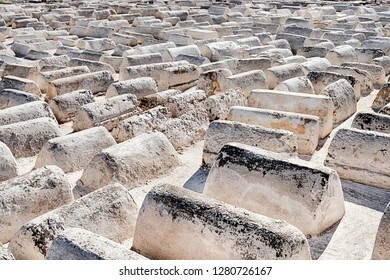 FES, MOROCCO - OCTOBER 19, 2018: The Jewish cemetery in Fes, Morocco is filled with ranks of white tombs. 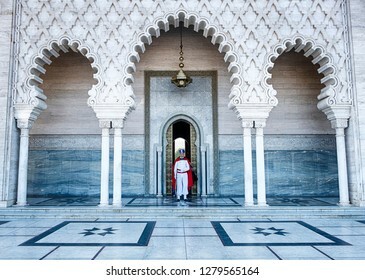 RABAT, MOROCCO - OCTOBER 21, 2018: A member of the Royal Guard in ceremonial uniform stands at attention at an entrance to the Tomb of Mohammad V in Rabat, Morocco. 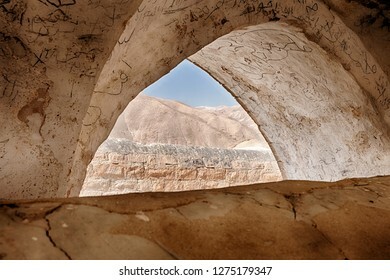 FES, MOROCCO, OCTOBER 19, 2018: A worker trims a pile of leather hides with a sharp knife after being dyed in the leather tannery in the old city of Fes in Morocco. 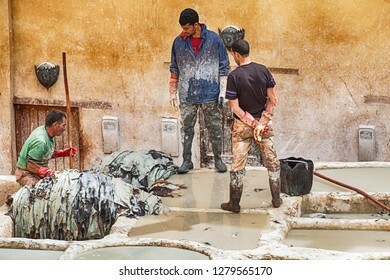 FES, MOROCCO - OCTOBER 19, 2018: Three workers in the Chouara leather tannery in Fes, Morocco soak animal skins in the tanning pits to soften the leather. 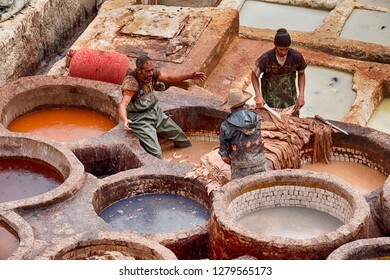 FES, MOROCCO, OCTOBER 19, 2018: Three men talk while standing in the tanning and dye vats while working in the Chouara leather tannery in Fes, Morocco. 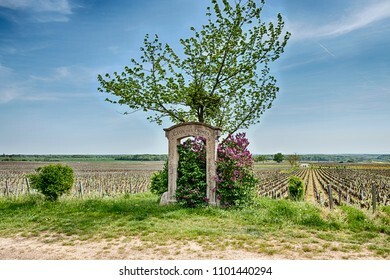 MOREY ST. DENIS, FRANCE - APRIL 22, 2018: An old stone gate marks the location of the premier cru Clos des Ormes vineyard near the town of Morey St. Denis in the Burgundy region of France. 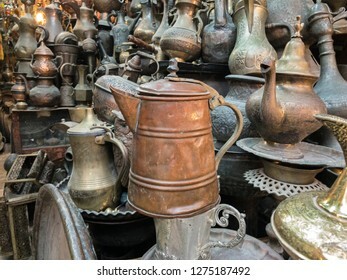 A shop in the Old City of Jerusalem displays a number of kettles and teapots of different sizes. 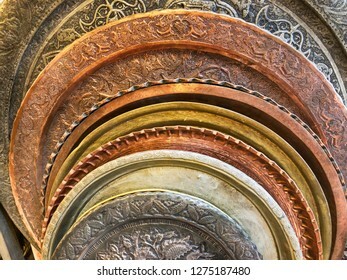 A series of round metal platters with detailed designs are for sale in a shop in the bazaar of the Old City of Jerusalem in Israel. 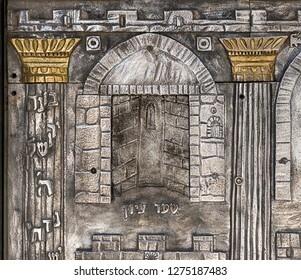 A detail from a panel on a door to the entrance of a synagogue shows an entrance to an old temple in the Old City of Jerusalem in Israel. 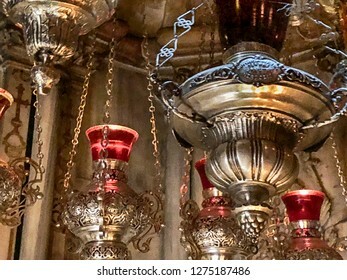 A series of oil lamps illuminate the interior of a portion of the Church of the Holy Sepulchre in the Old City of Jerusalem in Israel. 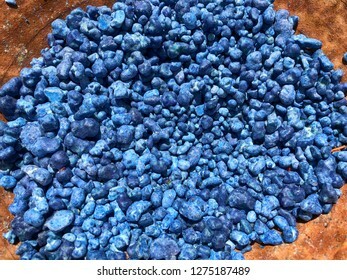 Chunks of a blue spice resin for sale are centered in a bowl in a shop in the Old City of Jerusalem. 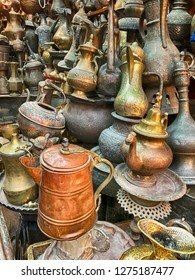 Metal kettles for sale in a shop amid the Old City markets of Jersualem in Israel create an interesting background. 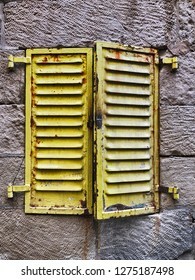 Yellow shutters provide a bit of color in the Old City of Jerusalem. 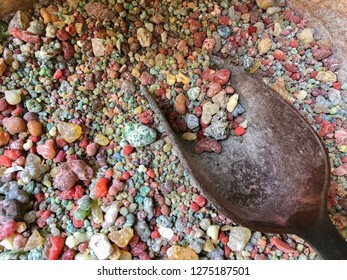 A bowl of colorful incense with resins of frankincense, myrrh and other spices is for sale in a shop in the Old City of Jerusalem in Israel. 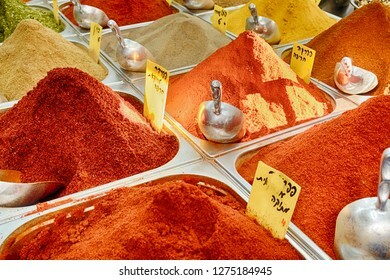 Fresh spices in a Jerusalem spice market are heaped high in a series of metal bins. 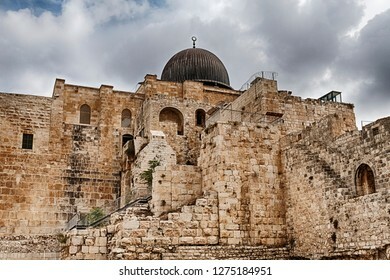 Al-Aqsa Mosque as seen brom outside the Temple Mount in the Old City of Jerusalem in Israel. 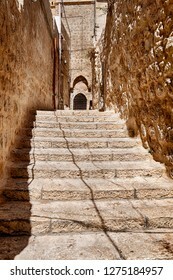 A series of steps climbs up a hill between buildings in the Arab Quarter of the Old City of Jerusalem in Israel. 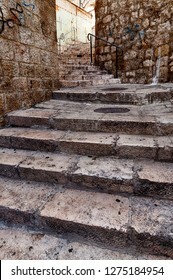 Steps lead toward the back entrance of a building in the Arab Quarter of the Old City of Jerusalem. 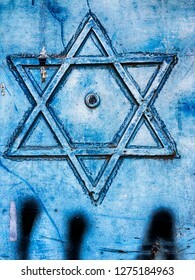 A six-sided Star Of David is a decorative element on a garage door in Jerusalem, Israel. 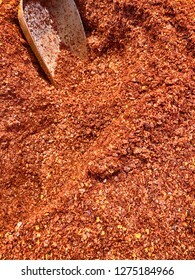 A bn of red pepper flakes with a scoop are available at a spice shop in Jerusalem in Israel. 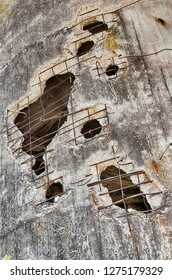 Holes in the concrete water tower at Yad Mordechai in Israel are a memory of the 1948 War between Israel, Egypt and other Middle East countries. 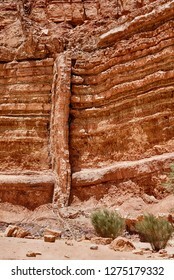 A pillar of basalt rack from a million year old lava flow bisects layers of red sandstone rocks in the Ramon Crater in Israel. JERUSALEM, ISRAEL - JUNE 14, 2018: A man reading the torah and praying at the Wailing Wall in the Old City of Jerusalem in Israel. 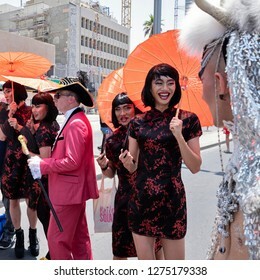 TEL AVIV, ISRAEL - JUNE 9, 2018: A man dressed in drag marches in the Gay Parade in Tel Aviv, Israel in 2018. 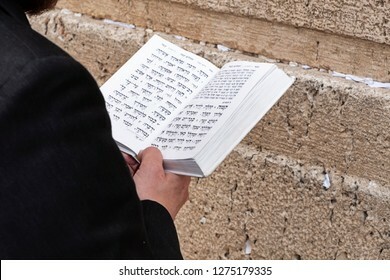 A hand touches the Wailing Wall in the Kotel during a prayer by an anonymous man in the Old City of Jerusalem. 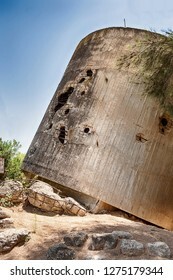 The water tower of Yad Mordechai is a historic landmark of the 1948 war after it was shelled by the Egyptian Army. 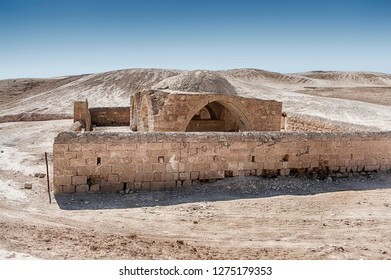 A tomb with a surrounding wall made of stone stands in the middle of the Negev Desert In Israel. 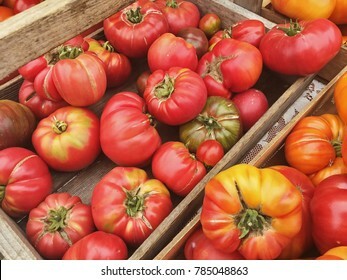 Wood crates of heirloom tomatoes are for sale at a local weekly farmer's market on San Juan Island in Washington. 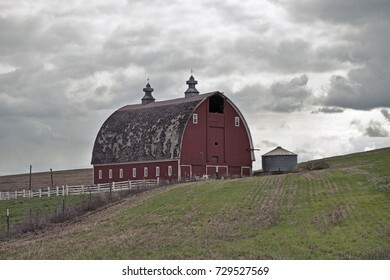 A traditional red barn on a farm stands on one of the rolling hills in the Palouse area of Eastern Washington. 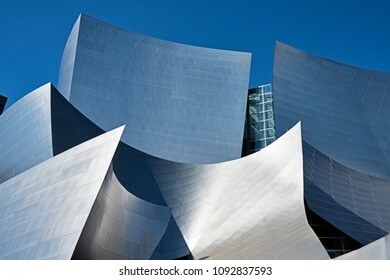 LOS ANGELES, USA - MARCH 5, 2018: The Walt Disney Philharmonic Concert Hall, designed by Frank Gehry is a modern architecture landmark in Los Angeles. 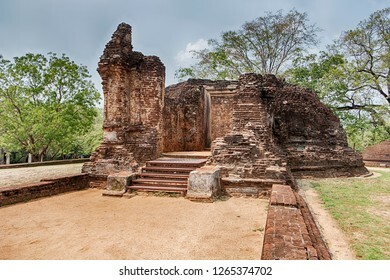 The ruins of an old stone shrine in the Potgul Vihara monastery area of the ancient city of Polonnaruwa in Sri Lanka. 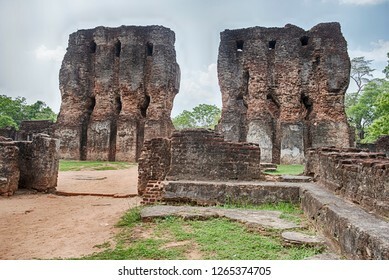 Two stone towers of the royal palace are still standing in the ancient city of Polonnaruwa on Sri Lanka. 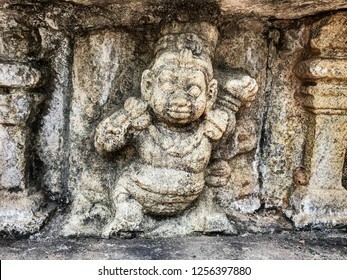 A decorative detail on the Vatadage dagoba shrine in the ancient city of Polonnaruwa in Sri Lanka shows a chubby little man dancing. 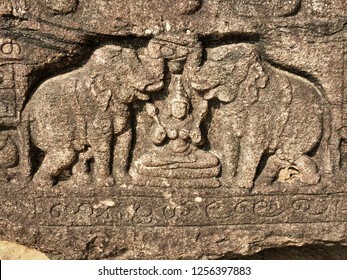 A background detail from the Gal Potha or Stone Book which is part of a srhine in the ancient city of Polonnaruwa in Sri Lanka.